Beachfront Stunning Views of the Caribbean! If Sun and Fun is what you are looking for: Look NO further. Picture yourself in the exciting tropics in your own luxury villa, with sun-kissed skies and the sparkling blue Caribbean Sea nearby. Feel your body succumb to the cool ocean breeze as it gently cascades over you, draining your stresses away! It’s not a dream! It’s Casa Del Sol! 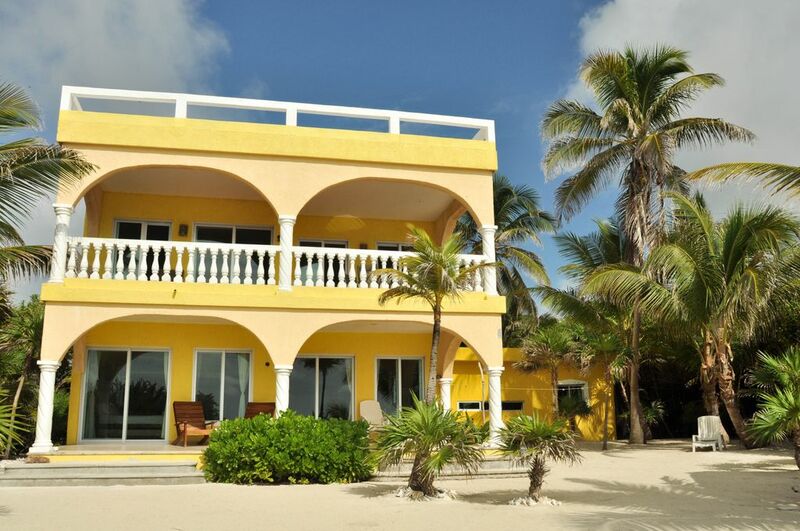 Casa Del Sol is a tropical delight, full of Caribbean color and charm located on the southern most point of the Caribbean in Mexico. The ocean front villa overlooks the 2nd largest barrier reef in the world. This 3 unit villa is completely private. Wake up in the mornings to a gorgeous sunrise and fall asleep at night listening to the gentle seaside. On the Beach level, the breezy bedrooms are located on either ends of the villa for maximum privacy for your group. The rooms are spacious with a queen size bed, single trundle bed, a 7 foot couch made from local hard woods, reading chairs and dinning room table for 4. Feel free to hang from the walls in a hammock to enjoy the flowing breezes as you take an afternoon siesta. Take an exciting swim out front in the coral patches visiting with all the tropical fish, lobsters, spotted eagle rays, sea turtles, and many more. The best way to describe the snorkeling in front is to imagine yourself looking into one of the most impressive stocked large salt water fish tanks around and next you know, you are in it. It doesn't get any better than this. All rooms are equipped with ceiling fans and have stunning seaside views. You will not find any televisions, nor will you want one since there are so many things to do at the house or nearby. There are many miles of beach to comb searching for the largest/brightest conch shell. Kayaking out to the barrier reef, biking down the beach road, tossing horse shoes, observing many types of birds, star gazing at night, or just relaxing on the beach with a book is a great way to spend your vacation. Luxury abounds as the living area is open and breezy and fully equipped for your relaxing enjoyment. The patios and verandas provide panoramic views of the Caribbean Sea, and spectacular Caribbean sunrises. In the mornings you will see the sun rise while looking out into the Caribbean and in the evenings looking back in the lagoon the sun will set. Other units are available or use the entire house for your vacation. Please inquire. The house is located in the marine park 'Arrecifes de Xcalak' which includes Chinchorro Banks (Banco Chinchorro). Upon arrival, please stop in at the park office to purchase your entry bracelet. The park office is in Xcalak, south on the beachfront. Many guests bring their own beach towels. Oven is in Upper Unit only. Stoves are in all three units. All three units have a dinning room table with 4 seats. Upper Unit also has a bar area with 4 additional seats. Upper unit has a Sony stereo with a hook up for IPods and phones for music. Bring cable. 2 kayaks, 1 double, and 1 single. Ceiling Fans, Juicers, Blenders, 24 hour hot water, 24 hour solar electricity, Bicycles, Kayaks, Life Jackets, Floats, Snorkels, Fins, and Masks. A Grocery truck stops by house a few times a week with fresh Meats, Fruits, and Vegetables. Lounge on the Beach or Patios with Beach Furniture or just take a siesta in a Hammock. Non smoking inside. We are still looking forward to sand, sun, and relaxation as unexpected medical trouble kept us from being able to travel. Thanks, Brent for the sunny rain check. We loved Xcalak and really enjoyed staying here. As with the other places in town, the electricity is solar and the water is from a rain catchment system. So, we had some power outages late in the evenings and made an effort to conserve water. My understanding is that the owner is working on improving the battery system to reduce the possibility of late night outages on electricity. We were in town to fish, and found that the house had good proximity to several of the best areas. If you're doing more guided fishing and planning to spend most of your time in Chetumal bay, the guides will want to meet in town and it could be advantageous to stay closer. This house is a bit more remote, and required a 20-30 minute drive to get to the boat launch area. Thanks for the review Ben. On solar systems, batteries go bad after a period of time, usually 4 - 5 years in the warmer climate. The current batteries were on their last leg and new ones have been ordered and being replaced next week. Sorry for the couple outages during the late evenings/early mornings. Guides will also pick you up in front of the house by boat, to avoid any driving at all. Casa del Sol was lovely! We had the beach to ourselves and the snorkeling was really great. Lots of fish, a variety of corals and also rays. Close in reef just past the sea grass was the best. The mangrove complex was not accessible unfortunately, as we had hoped to take a kayak into it. The unit was cozy, clean and well provisioned. There were also plenty of paperbacks to read, bikes to ride and plenty of loungers and hammocks for relaxing. Stacy the caretaker was helpful and pleasant. The beach in front of the home was clean, unlike the rest of the beach areas in Xcalak. Because of that, I don’t recommend walks along it due to seaweed and trash washed up. Brent was very responsive and helpful. He checked in on us a couple times via text to see how we were doing. The view from the roof was incredible and sunsets and sunrises amazing! This is definitely a must stay for those who want to be away from the maddening crowds, and don’t mind “roughing it” a bit. I.e. off grid so be mindful of electric and water useage. Nice to have solar power and we were never without power or water. Internet worked great! Great place to get away. Solar powered, great views from awesome rooftop where you can see the stars at night with hardly any light pollution and see the ocean and lagoon during the day. Great snorkeling right off the beach . Fishing if you want it..
Truck comes by almost daily with fresh fruits and veggies. Try the Pibill (sp?) Mayan pulled pork with spices. The bed sheets great, nice mattress, nice kitchen… everything works, there was even ice in the refrigerator! Great coral and fish to view right in front of the house. You’re out in the jungle… no civilization, I loved this. Just remember to take your own food. I had a wonderful time with my son at this house. Beach was fantastic and clean. The room was comfortable. Xcalak was just the right amount of quiet. Do yourself a favor and get out to dive the banco chinchorro, gorgeous!! The caretakers helped us out of a pickle when the mahahual gas station shut down for a week. World-class Scuba Diving and Fly Fishing. Three local groups PADI, NAUI offering Resort Courses, Open Water Certification. Day trips to Belize, or arrange a 1/2 - full day of Fly Fishing or Sportfishing with guides. Snorkeling trips can be arranged, however snorkeling in front of house is the best you'll find in the area. Take day trips to ancient Mayan Ruins (Muyil, Dzibanche, Kinicha, Kohunlich, Oxtankah), Spanish Fort in Bacalar, Museums, Cave Diving, Cenote Diving/Swimming, or just a shopping day in Chetumal (Qoo-Roo's capital). Once you are back home, head to the rooftop for the best star gazing you can imagine. Rates for the Upper Unit are: Low Season (May 1 - Nov. 15) $85/Night, 4 Night Minimum. Mid Season #2 (Nov. 16 - Dec. 14) $100/Night, 4 Night Minimum. Christmas/New Years (Dec. 15 - Jan. 10) $175/Night, 4 Night Minimum. High Season (Jan. 11 - April 15) $140/Night, 4 Night Minimum. Mid Season #1 (April 16 - April 30) $125/Night, 4 Night Minimum.